HDFC Diners Club Premium Credit card variant stands equal to the Regalia credit card which is powered by Visa/MasterCard. Both comes with 1.3% savings on all spends. However, Diners cards has better privileges when it comes to travel benefits. 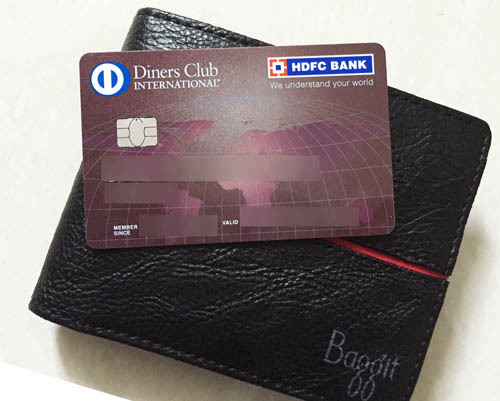 Compared between Diners cards, it holds the position above Diners Rewardz which we reviewed recently and below Diners Club Black which is the flagship top end variant offered by Diners Club International in India in association wit HDFC Bank. Apart from the advantages of concierge services mentioned in our previous article in HDFC Diners Club Rewardz, the reward earning rate on Diners club Premium credit card is pretty decent and equivalent to Regalia credit card. Redeem reward points for booking Air Tickets / Hotels across 150+ Airlines and Choice of hotels (Domestic & International). You can also Redeem Reward Points for AirMiles against Jet Airways & Singapore Airlines. New Feature added: Now you can also pay Postpaid/Broadband bills using your reward points. This is applicable only to Primary card holders, however, Add-on Card Holders are also able to access the lounge as reported by couple of readers but not officially allowed. Hence they may revoke this feature anytime. Its Hit or Miss if you want lounge access for Add-on Card as well. Redemption of Reward Points: Earned Reward points can be redeemed for air miles against Jet Airways & Singapore Airlines. or for booking hotels or air tickets across 150+ domestic or international airports/hotels. Renewal Fee Waiver: The annual fees of the card is Rs 2,500 which can be waived off if you spend Rs 3 lakhs in past 12 months. Complementary Airport lounge access: 6 Complimentary access to 500+ Lounges Worldwide in a calendar year. The card is overall best suited for you if you are a frequent traveller. The features are designed so as to give customers a special treatment. This is the one of such credit cards which has the ability to provide unlimited lounge access in India. Not to mention, Diners club often run 10X rewards promotion with selective brands which might be a major reason for you to own this card apart from its usual travel benefits. Diners Premium Credit card is still good just to enjoy the 10X rewards for a limited time. Once it goes, you should switch back to regalia as it has better acceptance compared to Diners cards. Planning to get this card? Drop your comments below! Hey the 10X reward points is from just MAy -June 2016. I am not sure if that is correct, any idea? Its likely to continue at-least till March 2017. Whether add on card holders are eligible for lounge access?? It appears to work, but maybe revoked anytime. I enquired about this and they said add-on card are not eligible for lounge and golf facilities. I don’t see the 10X rewardz point on their portal. May I know where did you check? Check out their “privileges” section in hdfc diners club site. I have an AllMiles card. I am wondering what I’ll lose out on if I switch to this (other than acceptance at merchants which I have backup cards for). i had applied for a credit card of hdfc.. but m confused betwen diners premium and all miles card. the hdfc guy told me to go for all miles. but i dont make any international travel. all ined a credit card is for online shopping, dining at metro outlets be it a restaurant or a bar, retail electronic shopping and few domestic travels and a lot of movies..
i have heard about the low acceptability of diners. can u guide me for a choice betwen these two ??? Diners premium good for shopping as mentioned in many other places. You still need some backup card due to acceptance issue. IS this not widely accepted? is this not a regular visa/mastercard credit card ? Acceptance of this card is very very low. I have till now tried in around 14 outlets. But not accepted. Accepted only when I do online shopping or airport lounges. So never ever go fort this card. Yes Sandeep, it can’t be used as a primary card. True that. Can you please tell how “unlimited domestic lounge access” works ? Could you please advice which is better option HDFC Regalia or HDFC Diners Premium? Diners premium is best for 10X rewards. I have applied for a HDFC Credit card Online. 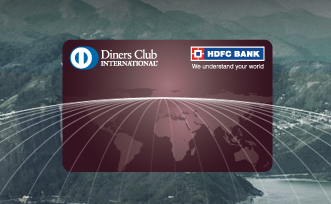 They offered HDFC Diners club rewardz…Is this the best one. Or Shal I ask for another. Please suggest. Its good to go with as a first time user. Additionally if features of both cards almost same as stated above that why Diners are rated as 8/10 and Regalia as 9.5/10 . Some of the additional features of diners is Golf course training , also u get movie tickets in schemes, unlimited lounge access in India etc??? In overall, Regalia has international lounge access and better acceptance due to which Regalia gets more credit. also in case transaction amount is say Rs 61. will i get 1.5 point, 1 point or 2 points. You get points modulo 150, times 4. Anything less than 150 is 0. 150 is 4 points. Anything until 299.99 is 4 points. This holds true for all Diners cards and all cards mostly. It hurts lesser when points work modulo 100. Check out Sbi Signature card. But sbi signature will have a annual fee. A free visa card? Is there any way to pay LIC premium using Diners club card? is there any way to pay lic premium using diners credit card. if yes Do we get rewards points for the amount and how we can pay it? I just received a regalia card but i felt dinners premium n black has more benefits then regalia. you can take air travel insurence higher in dinners,medical insurance at overseas higher in dinners and also baggage lost or delayed is being paid in dinners.reward points are also extra in dinners card. Try for Black after couple of months as they wont switch cards in short time. I am holding premium diner card and have applied for regalia just to get the taj membership to avail free nights vouchers. Is it a good idea to upgrade. Can’t we hold 2 cards from same bank. Also I have some points in premium but I am not able to get any information from bank that how many points will be transferred to regalia. What is the ratio in which they transfer the points even they are of same category and have same conversion rate I.e 1 point is 0.75 Re. Technically you should get 100% on this conversion as both are in same tier. 2 cards on given at times and it highly depends on your credit limit & portfolio with the bank. Does this card offer unlimited access to domestic airport lounges for just the card holder or his family members as well? If yes, then how many, and if no then whats the way around? Do I need an add-on card in that case? Lounge access Only for primary card holder and not to add-on cards. You might need Regalia/Diners black for your requirement. Do we receive points on jewelry purchases? HDFC has not credited me points for the same. Do i take it up with the bank? Am unsure about this. yes, do contact bank. I tried changing from regalia to diners premium. I sent my income slip to them but they said I am not eligible as per documents i have sent but they didn’t bother to specify even after asking a lot of times . They only said i am not eligible for any diners card as of now. I am unsure how I was sent regalia 2 months back with similar income slip(net after deductions around 70k). Should i try sending upgrade form again without any attachment of income slip as both cards are almost at par? Its now considered as a superior card than Regalia. What’s the existing credit limit? is regalia more than 6 months old? Credit limit is 2 lakhs and card is 2 months old. 2 months is too short for change of card. Try to change after 4-6 months so that you’ll also get higher limit with Diners premium. My regalia with 2lakhs limit is 4 months old now and my upgrade request to diners premium was cancelled on the basis that diners premium is downgrade to regalia as per their internal terms and conditions. Should i ask for diners black or should i close this present regalia and reapply for fresh premium? What will be the best option? If you’re eligible for Diners Black, yes! why not?! It depends on what benefits you need from your card. Dual card is possible when you have high limits. I mean, should i do 1 by 1 or both (upgrade & new application) together? What you suggest? One by one should be good. Any idea if other HDFC Bank promotions like 5x promos listed on their smart buy website such as shopping at dmart/easyday etc will also be applicable on diners? Yes, it does. I’ve used on Smartbuy & got 5x. Do we need to use the code for makemytrip purchase or will ir automatically be 10x? @Sid: Used at MMT without the code. Got 10X ? Though i booked a package , not a flight or hotel. That’s Good to know Abhay! one of my friends told me that even though his card is hdfc diners club rewards card, he was charged for the lounge. it was a domestic lounge and it was in the list of lounges. he said that in the application form, there is some tick box which asks if you would like to have the lounge access. is this true. please enlighten. He might have added a guest. I have one premium Diners card and would be going to Mauritius with a lay over in Maldives. This is my first foreign trip and very unsure on how to access the lounge, the fees, is the food and stuff free at the lounge and many more such stuff..If you can write a blog for a tyro…that would help…Also, i would be taking my wife along but she do not own any card..Can i take a add on card and use the facilities of the lounge? Please help. Many thanks in advance. You can access food & lounge space with a swipe. Its only available for primary card holder in this variant. Have you been declined lounge access on add on card for dinners premium ? Do they check the name on the card with the flight ticket ? If i use my add on card and if it is not eligible for free visit will they tell/warn me about this or will they charge the fees directly without warning if it’s not free. If I upgrade from Regalia to Dinner’s premium, will the rewards points in Regalia will be transferred to Dinners premium card. I have around 10K points in regalia. I am a little confused. I have an add-on card for my wife. For the lounge access, I contacted the customer care who said it is not available for add-on card. But my phone-banker said starting this month, they have extended the benefits to add-on card as well. I don’t know whether to believe my banker and risk getting charged for 4-5 lounges during our entire trip. Whats the update ? Is lounge access free on add on card too ? I am having HDFC Diners premium card and accumulated 40k points. Now how I can convert them to air miles. Can you please explain in detail? I heard there is two programs from Jet airways and Air India. You can instead book flight tickets directly from the portal. That’s the best way. Since I might not be eligible for black, how about closing regalia first and then fresh application for diners premium? Will it work or will they won’t issue card anymore? Donot close. Just ask for upgrade to Premium. There lies the problem. They have refused premium saying its a downgrade from regalia(2lkhs limit) and i am not eligible for black. Any other options do i have ? Thanks a lot for the very informative blog. 1. Could you please suggest me on the better card between Regalia First vs Diners Premium. 2. Could you also please let me know if we can transfer our AirMiles of Diners card to airlines? 3. Do you have any URL or any evidence(which you share so that i ask the same to HDFC) of 1000 RP when we spend 1000 Rs , 5 times in a month? I currently have Diners Rewardz. And looking for an upgrade. Hi, i have HDFC visa all miles card and am a preferred customer with HDFC bank. I have requested my relationship manager to upgrade my credit card to Diners club Black. but he instead informed me to go with Diners club premium saying diners club requires INR 1.5 lac/ month salary credit. i am falling short by 30K. is there a way to get Diners Black?? That’s bit tough to upgrade from Allmiles.Though it depends on your Credit Limit and your overall relationship value with the bank. Thank You. They are offering Diners club Premium at the moment FOC along with an Add on card. may be i hope there is a possibility for future upgrade. By adding Add on card through net banking portal or calling customer care , does it become LTF ? I think people often overlook the single biggest benefit of Diners Club — currency conversion markup pegged at 2%. Even Citi and Amex can’t compete with that. The interest rate, too, is 1.99% pm. No other card can beat that because no other card is so less accepted and therefore is so safeguarded against fraud, by design. I have Citibank Rewards Card for the past 5 years with 3.5 lakh limit. I am trying to get the HDFC Regila card. I applied online and got eligible for HDFC Regila or HDFC Diners Premium (both life time free). But the guy who spoke with me over the phone and came to collect the documents told that only HDFC Regila First is possible. I was speaking wit him to understand the reasons for the same. (as the online portal clearly was showing I am eligible for both). His argument was first time customers are given only Regila First and will have to upgrade at a later point in time. After few minutes of talking, He was fine with issuing HDFC Diners Premium(Life time free). I have settled with this Diners premium card as of now. 1) When you are given a free Life time card , and may be after few years, if you want an upgrade to Diners Black Or Regila, Will the new card still remain as Life Time Free? 1. Depends on offers at that time. Thanks Sid for all the reviews done in your blog. Finally my Diners Premium card arrived. Will press the pedal on 10X rewards from now on. 1) Can i go to an HDFC bank ATM and set up the PIN ? Or should i wait for any PIN from customer care before heading out to an ATM ? 2) Do you think the 10x rewards be extended after March 2017? 3) Movie ticket booking using points or Prepaid recharges using points will incur Rs 75 charges ? I think you can add one more comparison parameter in Diners club card variant (all) that is in regards to foreign currency transaction. I am sharing with my experience on Diners Premium card and long discussion with Prinicipal Nodel Officer desk at HDFC Bank. Though HDFC Diners Club cards have only 2% of FCY Conversion fee, the exchange rate on Diners club card is approx 1.5% higher than Mastercard/VISA. e.g. If you are spending US$ 100.00, you may have to pay different exchange rates based on card type (VISA/Mastercard/Diners/Amex). Visa may charge you 68 Rs/$, Mastercard @ 67.89 Rs./$ and Diners club will 69.4 Rs./$ (approximate close number to explain). Most of the time, Mastercard variant has lowest exchange rate so you get benefitted. Diners club is the most expensive for FCY transactions. Effectively you will be paying 3.5% FCY fee while using Diners card so beware of this hidden component. Discover/Diners club is not transparent at all in exchange rate. You can see Visa and Mastercard rates on website while Discover keeps the exchange rate hidden. Hope this will hit one negative in Diners club card. However there are other benefits that may absolve this shock. Siddharth any conclusion which is best for forex transactions. I have recently done many transactions on Regalia and found the conversion rate to be good. If you can both, pls go for it. Though that doesn’t seem to be the offer now. Diners good for 10X offer which runs now and then. Regalia is evergreen. Also Diners penetration is low as of now. Finally I also got hands on Diners Premium. Since I’m having Regalia my RM told it’s not possible to give 2nd card (even though they have agreed in the past, they told that policies changed recently). So what I did was I applied for Diners Premium for my wife plus add on card for me. I was expecting a very small limit as her monthly take home was less than 20k. But to my surprise it came with a credit limit of 2.5L. I didn’t understand how they calculated this limt. Now i have to make use of 10x offers before they expires ? For MakeMyTrip we have to use the coupon code hdfc5x or we can use some other coupons & still get the 10x points? HDFC is giving option for Regalia First & Diners club premium with lifetim free offer if I register one bill in autopay. Received my Diners Premium (Floater card) today as LTF. Tried for the Black card (by writing an email to HDFC ), but was told they are not issuing floater cards anymore. So, got Diners premium approved through my RM. Diners Premium is still good. Congrats! Big fan of your analyses. After doing some research on my own as well, I found the Diners Premium to be perfect for me as my main agenda was online shopping and INTERNATIONAL LOUNGE access. I applied, got the application approved and then the wait began! However, I received the Diners Rewardz (downgraded version)!!!! HDFC bank is dumb enough to do this mistake and I want a good alternative to this awesome card now, thanks to the sour experience with HDFC. Do suggest whether Diners is available with any other bank. Its due to the eligibility criteria that they don’t issue Premium that easily. You can simply upgrade after 6 months of usage. Sadly, Diners is currently associated with HDFC only for time being. Maybe with other banks in coming years. I recently got an offer on my net banking portal for a life time free diners premium. The offer said that in case i opt for smart pay i would get the card as a life time free card. I received the card about 5 days back and i had registered for smart pay the same day itself. However the bank still hasn’t made my card LTF. I registered a complaint via email for the same but got a reply saying that in order to get a LTF card i need to register for smart pay, which i have already done and also registered a biller there. Now shall i wait for the bank to make it life time free and then start using the card ? Would that make any difference ? Are there any possibilities for the bank to not acknowledge the promise been made to me ? Just wait for 1 charge on smartpay biller and then check the status, it makes sense. Shall i then start using the card ? Also, they have given me a current limit of INR 1,50,000 which i feel is really less. So i was thinking of routing all my current expenses through this card and then apply for a limit enhancement after 6 months or so. Though i do not want to max out my card which might not be positive for my CIBIL. So just wanted to ask, what might be the appropriate range of expenses that i should look at in order to apply for a limit enhancement later. Pls check limit enhancement article. How did you checked if it is LTF ? nd whts the status now . Did they make it LTF ? Do you get any acknowledgement once it is made LTF ? Ia there any validation amount taken by diners like mastercard (Rs 25) for authorization of lounge visit ? How will I know that I am not being charged extra and I have still my limits of accessing intentional lounges left . Will the lounge staff will tell me that my free limits has been exhausted or If they have been exhausted they would directly charge me without consulting/warning me if I still want to use it ? Rs.2 with Diners. Usually they say if limits exceeded on MC/Visa. Not sure about Diners. 1) For every generation of voucher on hdfcdinersclub website? 2) For every recharge/bill pay/ticket booking using the voucher already generated? 3) For every both of the above transaction? Can u tell me what is the eligibility for upgrading from diners rewards to diners premium? Sadly not. We’ve to wait for an update on that, or maybe from other users who did Smartpay Txn. Hit or miss! I am using HDFC moneyback credit card since Sept-16 with around 0.8lc limit. I can not see anytime credit card upgrade or limit enhancement option in my netbanking. I want to upgrade to Diners premium. Sad.. Suddenly from today, I can see one banner in my netbanking account regarding an LTF card by opting to Smartpay. My concern is that Can I apply from there, as I already have a card with them? What are my chances? Whats the income criteria for applying for LTF diners club premium credit card?? and whats for diners rewardz?? I am already having diners premium from last 1 yr and 3 months and also using it for max of my expenditures. Now i tried to upgrade to Diners black but customer care said that you are not elgible for it as salary requriement is 1.7 L per month for it. Now i am confused should i go for regalia while i am having diners premium. Because it seems that diners premium is more rewarding in terms of points system. Only benefit i am seeing that Priority pass can allow family members for lounge access. Having both really helps, as long as you spend more. A very basic question on reward points accrual: for Diner’s Black, do you have to spend a minimum of Rs.150 to earn the reward points, or will they be pro-rated based on the amount of spend? For instance, will some points accrue on a spend of Rs.100 on an uber ride! Just wanted to know, does HDFC inform before devaluation of cards beforehand? The issue is I have good accumulation of points currently, but fear if they will continue with the same conversion rate post 30 Apr. If not, I stand to lose some money, else should I generate voucher to be on the safe side. They give sometime for redemption usually, like a month or two. Really appreciate you for such a wonderful blog and prompt response to all of our queries. I do have few questions on same topic. I am holding a regalia first card and was looking to get a diners black. But I was told that I am not eligible for diners black, but I think I can get it through my RM. But what is concerning me is that, it comes with an annual fee of 5000. Only first year fee can be weaved off by registering a bill smart pay. Do you think we can it LTF by any chance? They have offered me diners premium LTF as a second card in addition to the Regalia first that I have today. Will that be a good idea to have both cards or should I cancel my regalia and go for diners premium? Does it affect my CIBIL score to hold two cards at a time? Finally, more of usage is on IRCTC, other bus transports, online shopping, groceries etc. Do you any other better card than this for my usage? Spend based waiver is there. How long will it take to get an upgrade from Diners Premium to Diners Balck if my monthly spending is 50K-75K on diners premium? Lots of factors are there. Check Diners Black thread. Fill and Send upgrade form to chennai. It should be processed. Sorry for being the harbinger of bad news guys. HDFC/DIner’s Club has made changes to the 10x partners and have also changed the accrual limits for the RP. Rewardz : 2000 , Premium : 5000, Black : 25000 . I have 25k points in my account. I found that they can be converted into miles from Airlines . And from the looks of it is cheaper to book intl. flights (not domestic) with miles than using the hdfcbankdinersclub portal. Can anyone validate my hypothesis ? Has anyone tried to convert the points to airmiles ? If yes, then what is the procedure and how much time does it take? is there any better way i can get better value out of my points ? 🙁 Looks like they have changed the privileges for Diner cards. Every thing is reduced by half and only 2 free movies pre month. Flipkart makes way for Amazon. And max points also changed. A little disappointed. I am planning to upgrade my card from Regalia first to Diners Premium. And I have around 9000 reward points in my Regalia first and when upgraded/downgraded to Diners Premium , what will be conversion rate? Do I get the same worth of points i.e 9000*0.4=3600 Rs which is around 4770 points in Diners Premium with conversion rate 0.53? I am planning to convert Regalia First to Diners Premium credit card. I have 9000 reward points in Regalia and If I convert to Diners Premium ,do I get the same worth of points ? What will be the conversion rate? DISAPPROVAL OF THE CREDIT CARD APPLICATION DOES NOT REFLECT IN ANYWAY ON YOUR CREDIT STANDING OR YOUR FINANCIAL STABILITY. I do hold AMEX and SBI credit card. What could be the reason? What should be my next step? follwing your blog and i am fan of this blog..
i am holding hdfc diners club premium LTF CARD since may i st 2017.
yesterday when contacted the help line, they reconfirmed that, the lounge access abroad available for 5 times each for both primary and addon card holders during the year, if go together. other wise 8 times a year to the primary card holder. it is not so in the hdfcdinersclub, where it is clearly mentioned that only primary card holder for 5 times, not available for addon card holder at all. Primary + Add on = 5 international visits / Unlimited Domestic visits. No one seems to have clarity in this regard. I bought goods worth 824 rs from Amazon but just got 22 points credited. I did not get 10x although i got hdfc diners premium card ? U will get in next statement. Please read the t&c on diners website. Which card is better ie Axis Burgundy Credit card or HDFC Diners Club black. My present DinersClub Rewardz card if lifetime free which I have been using for last 1year, if I request for upgrade to DinersClub Premium, will the new card also be lifetime free or it will be a charged one. Had a very bad experience while redeeming a flight via diners website. The ticket they provided for a Ryanair flight in Europe was insufficient to board. Also with the premium card their helpline number does not seem to work 24×7 anymore, which meant I could get in touch to solve the issue in time. In the end I had to shell out 50 pounds at the airport to manually check in. Am seriously considering to get rid of the card. What seemed to be the issue with that ticket? Did they explain anything afterwards? what is the current situation for lounge access for add on card in diners club premium card. i am having a all miles card at present and want to upgrade to either regalia or diners club premium. but i want my son’s add on card to also have lounge access. which should be the best option. My cousin was allowed lounge access in both his add on and main regalia card. Is this the same in diners premium? regalia also provides priority pass, is it only for international or accepted in domestic also? Please compare both for other offline purchases also like Grocery, fuel etc. I got my Diners Rewards upgraded to Diners Premium today. This upgradation busted a few myths present among Hdfc users and RMs alike. 1) there is no limit barrier for this card atleast, I was told by the branch that upgradation to this card requires good Limit above 2 lakh at least. 3) even Hierarchy myth b/w regalia and Premium is blown. There is no such thing, as I was offered the former too. I am in the process of upgrading from Diners Rewards to Diners Premium. After the devaluation of this card, i,e, from unlimited domestic lounge to 6 complimentary lounge access. By the way, great research on all Credit Cards, have been following your research from quite few months now. Is this card still worth getting? It’s being given life time free. What would you suggest? Dear Sid, I think you need to update one info here. Air India is no more a transfer partner of Diners points. Left with only two, Jet Airways & Singapore Airlines. Thank you. just did it. Regular reader on cardexpert. Love the work you put into these articles!!! Now, I see that the post isn’t updated to highlight that the annual fees currently is 2.5k while the post mentions it as 1k that can be waived off after 40k spend in 3months. Is the wavier still valid in the current scenario? Just updated that part. Renewal fee waiver on spend is still there. 1. I have multiple times applied for upgradation of Rewards to Premium, but I dont get any reply from Bank and the application gets rejected saying that I am having two cards. So should I surrender one card and then apply for upgradation. 2. Should I drop the option to upgrade and look for any other bank credit card. If yes, please suggest some good option. P.S.I have flexibility that I can open new Salary A/c. i am having hdfc regalia LTF card with Rs.3 lacs limit since last one year. with huge devaluation and limited redemption options which hdfc card should i try for upgrade? for better returns on low cost. i also have yes bank preference card though. please advise if i should try to upgrade for hdfc-diners-club-premium-credit-card? I have applied for upgrade from rewards to premium and my card is upgraded. I am yet to receive the card. I have been using rewards diners from 9 months and my salary is below threshold of premium card. but you need to submit pay slip and account statement along with application form and place it in cheque box in HDFC ATM. Today, I was told by the HDFC Executive that the “Diners Rewardz” card does not have any “Airport Lounge Facility” now. Earlier there were unlimited access to domestic Airport lounges through this card. Now the facility is completely removed. Is it true or are they misleading ? The lounge access for Diners Rewardz was discontinued a while back. Icici PoS terminals have stopped accepted Diners! Just inserting the card chip card read error is coming! Tried it with couple of merchants. Does the add on card for HDFC Diners premium has access to free International lounge program offered or it is only the primary card which get these benefits. I’ve been riding my HDFC RM pretty hard these days as their service standards are becoming increasingly sloppy. He has recently offered to get me a Regalia from my diners premium since I held it majorly for the golf benefits which are now discontinued. My question to you is, if this is possible, should I convert my diners premium to Regalia? Also, is it possible to hold both cards on a shared limit? I have the same question whether to convert or not. Dear sid, we can convert premium reward points into jp miles at 1 point to 0.25 jp mile. While redeeming these jp miles, again jet will revalue them very low. Any provision available for converting jp miles into diner reward points? I came across this site 1 week before and found this site to be very informative. Might have tried for Diners Club Black, had I gone through the site before. My monthly gross Salary only (not net) meeting their eligibility criteria though. Now it seems too late and need to wait for 6 months at least. In 4th week of February 2018, I have received Diners Club Credit Card with 4L limit. This is my first credit card from HDFC and don’t have any other relationship with them. I had applied for Diners Club Premium through the representatives who put up stall in my office. The card colour is same as Diners Club Premium. But nowhere premium is mentioned. It is mentioned as Diners Club International in the welcome letter and booklet. In booklet, they mentioned unlimited domestic lounge access and 5 international lounge access. Also they mentioned about gulf lessons. Hence, I am wondering if it is old booklet or there is some some change in cards/features.. I did a purchase of 18K from flipkart through smartbuy using diners club intertional CC. But logged into smartbuy using email id and password and then clicked flipkart link. Also I got 1250 instant discount on HDFC card. Does this transaction qualify for 10X reward points? Guys pls don’t take any card of HDFC on the basis of their tele executive direction. As their executives are sharing fake benefits of the card just to complete their target. Neither they think about customer exploitation nor the bank. I am using HDFC dinner club card and just fed off their service and their response on the customer complaints. Which credit card has the best/least FCR Markup fee for online transaction, my monthly Gross salary Rs. 75000/- p.m. I need the card for daily international transaction online for a side hustle I am working on. Your suggestions will be highly appreciated sir.